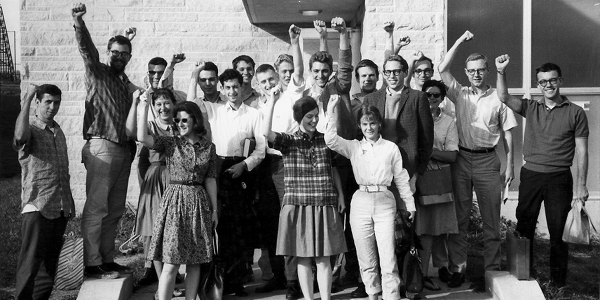 The 1960’s began when The Port Huron Statement was completed. Years ago, folksinger Phil Ochs wrote a biting song titled, “Love me I’m a Liberal,” that skewers the 1950’s and early 1960’s suburban liberals whose actions never rose to their ideals. Ochs wrote about liberals who were in favor of Civil Rights so long as it happened in somebody else’s neighborhood or people who favored their union but would not fight for others as they strived for social change. What Tom Hayden and his colleagues crafted in 1962 was an attempt to put these abstracts into action. With that, The Port Huron Statement was born. He document became the founding statement of the Students for a Democratic Society (SDS). Written in the Michigan community that bears its name, it was a series of thought pieces that desired to address the racial segregation and Cold War ethic that drove decisions coming out of Washington. As we look back with modern eyes, some of the most glaring social ills of the 1960’s are one yet others remain. We forget that when the decade began, we still lived with our own explicit version of apartheid in the South and a quiet more subtle and implicit variety up North. If you were African American or non-white in the South, there were daily reminders of antebellum life seen through modern slights and social insults because life might have been separate but it was never ever equal. African Americans in the South were legislatively barred from many of the fruits of liberty those on the other side of the color line freely enjoyed. While Jim Crow did not legislatively extend itself into the North, racism was alive in well in places like Chicago, Boston, and New York, as well as in towns and hamlets throughout every state north of the Rappahannock. It was easier for Northern fingers to point at the South because the Bull Connors and the Orville Faubus’ of the world never cloaked their hatred in the polite language used elsewhere. People forget that when Willie Mays came to liberal San Francisco, after the Giants moved west, racial covenants found within real estate made it nearly impossible for him to find a home in the city. It was so personally humiliating that the Mayor of San Francisco, George Christopher, offered up his own home to Mays and his family. When you read the Port Huron Statement today—through modern eyes—it pretty tame stuff because many of the big battles that defined the 1960’s and 1970’s are forty and fifty years in our rear view mirror. Yet many others continue. The Port Huron Statement was written just after the first Freedom Rides and Woolworth sit-ins but before Martin Luther King’s “I Have a Dream” speech on the steps of the Lincoln Memorial. Lyndon Johnson was still Vice President and years from enacting what became The Civil Rights Act of 1964, the Voting Rights Act of 1965 or the Open Housing Act of 1968. The supporters of Jim Crow, now in their 11th hour, were not going to be dragged off of the stage until it was legislated away. George Wallace emerged as the new an intolerant voice of the South, who after losing the primary in the previous race for governor, promised that he would never be “out-segged” (or words to that effect) again. Membership in the Klan rebounded and hatred filled the airwaves. Back in 1962, the American presence in Vietnam represented a Cold War inheritance from the French, who departed after Dien Bien Phu. There were several thousands of American advisors, who were teaching the South Vietnamese to fight for their own country so that they could choose their own fates. It was seen as a potential Cold War flashpoint that rational actors could resolve, not unlike what took place in Cuba that year. There were no campus riots, nobody burned their draft cards, there were no Weatherman creating bombs, and the political turmoil in places like Saigon or Da Nang, or Hue were buried in the back pages of The New York Times. Women were marginalized and could not build lives of their own, unless they were natural extensions of their husbands or families. The idea of women buying homes, opening up credit lines or establishing their own identities other than Mrs. John Smith was seen as radical affront to the American family. If this commercial for Folgers aired today, there would be rioting. However, the escalation of Vietnam War and its opposition on the home front radicalized the social movements. Body bags were coming home with those who were unable to find the right loophole to evade the draft. Campuses erupted and cities endured “long hot summers” of rioting by the inner city poor. As 1965 became 1967 many social movements that called for non-violence were eclipsed by others who demanded direct action. Its hard o believe that in these modern times Martin Luther King Jr was being shouted down by newer voices, like Stokely Carmichael (Burn Baby Burn) or members of the Black Panthers. In the short span of only six months during early 1968, the wheels had come off American society. In January, General Westmoreland called for an additional 200,000 troops to fight the North Vietnamese, where already 500,000 troops were stationed in the war zone. The brazen nature of the Tet Offensive, which was actually a military defeat for the Viet Cong and the North Vietnamese regulars, wrecked any sense of American inevitability. With a presidency in shambles, Lyndon Johnson announced to a surprised nation he would not run for another term. Weeks later, Martin Luther King Jr. was assassinated on a Memphis hotel balcony. After winning the California Primary, Robert Kennedy was killed in the kitchen of the Ambassador Hotel, and Richard Nixon had emerged as the presidential favorite and won his nomination. However, it all came to a head in Chicago when the Democrats met for their convention. The violence outside the convention hall, when combined with the political infighting outside, the coalitions that supported the Democratic Party were irrecoverably broken, Hubert Humphrey won the nomination without entering a primary, and the student movement further radicalized, reaching a new level of anger after three died at Kent State when students protested Nixon’s invasion of Cambodia. The Chicago 7 trial, which included Hayden among its participants, developed into a farce and after the conviction was overturned. Within a year, Dan Ellsberg convinced The New York Times and Washington Post to publish the Pentagon Papers. For the first time in American history, citizens had a chance to understand how a national blundered into a terrible war. As the decade ended, Daniel Patrick Moynihan, who then served in the Nixon White House, replied that we all needed a break and urged the new president to follow a policy of “benign neglect” when it comes to race. The 60’s were over and an exhausted nation limped into the next decade. But the question that Tom Hayden asks is this: Did the 1960’s work? I believe that the answer is yes. Aside from the downsides of excess, Americans gained a more complete sense of citizenship by decade’s ended. African Americans were registered to vote by the millions and the political complexion changed in the period of 5 years. The Civil Rights movement mattered. Ending Jim Crow was monumental. Allowing people to live in neighborhoods of their choice renewed the American Dream for many who felt consistently excluded. We are a better nation for it but it was painful to get there. Part of it is because the legislative process tends to be reactive as opposed to proactive. The horror of seeing police dogs and fire hoses turned on peaceful protestors in Birmingham Alabama and the death of three civil rights volunteers in Mississippi prompted the 1964 Civil Rights Act. The national embarrassment of watching peaceful civil rights marchers being savagely beaten in Selma helped to pass the Voting Rights Act. Great Society programs like Head Start offered a bridge to generations of poor children would be continually left behind. The 1960’s also provided the conservative backlash that we still see today. Without the student movement of the times, there would have been no Ronald Reagan or the rise of the modern conservative movement. A growing radicalism on one hand was met with a growing reaction on the right. Working-class parents might have benefitted from New Deal Programs and been uneasy with the war in Vietnam but they had no stomach for student protests and saw the current generation as spoiled when compared to their own hardscrabble Depression upbringing. It took the release of the Pentagon Papers for another seas change to take place as views on that war changed. Student movements radicalized too. The SDS moved past its non-violent roots and began to splinter into a series of more violent groups, most typified by groups like The Weatherman, who wanted to bring real harm to servicemen and first responders by disrupting society. After an explosion at a make-shift bomb factory in a Greenwich Village apartment, most went underground for years until one by one, they reemerged, and served their sentences. When groups like The Black Panthers walked into the California State Capitol armed to the teeth to show that they would not be intimidated by The Man, the reaction launched the current political gun culture on the right we see today. When student groups radicalized and turned away from a non-violent approach, they gave up the moral high ground. Seen through modern post-9.11 eyes, the mayhem caused by The Weatherman is on par with the death and destruction caused by the 2013 Boston marathon bombers. Considering that the bomb that blew up in Greenwich Village was meant to harm, maim, and kill US service members at Fort Dix, this is terrorism pure and simple. In that sense, their direct action voided any intentions. Though his politics are not mine, when it came to the Chicago 7 trial (which became the Chicago 8 with the inclusion of Bobby Seale) , I always felt that Hayden was the most serious of the group, Instead of being a trial that dealt with a number of serious issues, the narrative continued to be drawn by Abbie Hoffman’s antics, which alienated a number of potential allies in the middle who would bring the troops home faster from Vietnam. In the end, their convictions were reversed and sociologists say that the period of great upheaval concluded in 1974, when Richard Nixon resigned from The White House. I always felt that the defendants at the Chicago 7 trial missed an opportunity to communicate a different message about the student movement of the day, who were for the most part remained non-violent. William Kunstler should have coached them to enter with a suit and tie and to knock off the outbursts. Had they entered the courtroom with a “Come Clean for Gene” presence, it would have been would have been much harder to demonize them and student movement as a bunch of” commie hippies.” I remain a bit surprised that people like Abbie Hoffman and Jerry Rubin could not have seen the agit-prop potential there. As the “we decade” became the “me decade,” Abbie Hoffman went underground in plain sight as “Barry Freed” before reemerging and later committing suicide in 1986. Jerry Rubin went from Yippie to Yuppie before being killed by an errant car in 1992. Renne Davis did. Bobby Seale ran for Congress…Most everybody who went underground came up for air during the 1970;s and 80s. 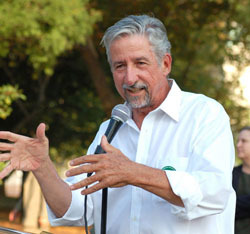 However, Tom Hayden took the more conventional route and unlike the rest, he carried his political arc through Sacramento as a State Assemblyman and State Senator before term limits concluded his tenure in 2000. When he first ran in 1982, his then Henry Fonda made commercials that vouched for his son-in-law’s character. I always found it interesting that Duke Cunningham, a legislative peer at the time, refused to shake his hand because of his anti-war activities. Cunningham, who moved on to Congress now serves in another place—the federal penitentiary system—for one of the most brazen acts of political corruption in the latter half of the 20th century. Oddly enough we are still refighting the 1960’s even though it’s now a half century gone. While few question when legislation like The Voting Rights Act comes up for reauthorization, Bill Clinton found his 1992 campaign in great peril because of his draft status and questions if he “inhaled.” In 2004, John Kerry was swiftboated by conservative activists, even though he served with distinction in a war which many conservatives fled. However, when Barack Obama emerged on the political scene, you would have thought his parents were Weathermen founders Bill Ayres and Bernardine Dohrn, with Saul Alinsky as his godfather. Yet when we look backwards through history at groups like the SDS, the video montage that emerges is the convention in Chicago, the bomb factory in Greenwich Village and some of the more violent student reactions of the times. However, what’s lost in the shuffle is the Port Huron Statement itself, a forward-thinking document of its time; one that presaged the legislative battles and the students unrest that was just around the corner. When Hayden walked into the voting booth to find an African American name on the ballot for president, it could only make his efforts as a Freedom Rider, Civil Rights protestor, and student leader during the 1960’s that much sweeter; a well-earned feeling that comes from being present at the creation.